With the decrease in temperature this week, I wanted to cook something hot, spicy and filling. I was reminded of Aladass, a Moroccan lentil dish, that I often buy when visiting Goldborne Road in West London. I scoured the internet for a recipe, but came up empty handed and decided to make up something similar myself. Moroccan cuisine contains a mixture of Arabic, Andalucian, Mediterranean and Subsaharan influences. The Phoenicians (a Semitic people from the Levant) colonised most of the Southern Mediterranean between 1500 and 300 BC. Next, the Romans conquered much of North Africa, particularly after the Second and Third Punic Wars against Carthage. When the Roman Empire collapsed, Morocco was ruled by a number of dynasties who were part of the Umayyad Caliphate. These Moorish people seized and ruled a large part of Iberia for up to 800 years. 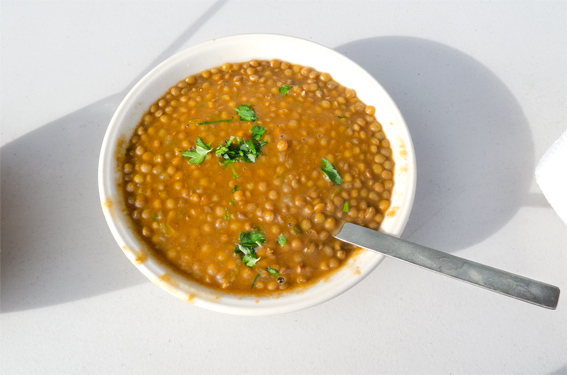 Lentils (Lens Culinaris) are probably the oldest domestic pulse crop, originating in the Middle East and Asia, which makes them one of our earliest food sources. There are (surprisingly) far more varieties than the common, brown, green and red. The annual bushy plants produce a lens shaped seed, hence lentil. These nutritious seeds can be dried and will last for years if stored correctly, making them a perfect food in a time before cans and refrigeration. There’s even mention of lentil soup in the Bible (Genesis 25:30-34) and several mentions in the comic plays of Aristophanes (Athens 446 – 386 BC). Soak your lentils the night before in cold water for 12 + hours or, A) soak for 1 hour and cook them in a pressure cooker or, B) buy them in a tin. Warm a level teaspoon of cumin seed and 8 cardamom pods until they give off a pleasant aroma. Do not let them get too hot and burn! Remove the cardamom seeds from their pods and grind all the warm seeds up with a mortar and pestle. Fry the onion in extra virgin olive oil until it goes translucent, before stirring in the carrot, celery and garlic. Grate in the fresh tomatoes (chop in half, grate the wet side and discard the skin). Mix in the ground seeds, pimentón, tomato purée, anchovy paste, turmeric, ginger and half the harissa. The heat in harissa tends to dissipate over time and cooking. I find it’s best to put some in at the beginning and add more towards the end – on the Goldborne Road stalls, they have little bowls of it, for the customers to use as a condiment. Harissa comes from Tunisia, but it’s very popular in Morocco. It is thought that the Spanish took chilli peppers to Tunisia, while they occupied the country between 1535 and 1574. Interestingly, people associate paprika (pimentón) with Hungary, but it’s the Spanish who brought it back from the New World in the 16th Century. Pimentón is all pervasive in Spanish cuisine and it spread quite quickly to North Africa. However, it took several centuries more for paprika to reach Hungary, in the late 19th Century, via the Ottoman Empire. Cut a preserved lemon (discard any seeds) into tiny pieces and put that in too. Chop up a bunch of fresh coriander – it’s cheaper to buy a big bunch from a green grocer, Indian, Turkish, Mediterranean shop, etc. than a tiny bunch from a supermarket. Coriander is known as cilantro in Spain and the Americas, but the English name for it comes from the old French coriandre, from the Latin coriandrum and Ancient Greek koriannon, which is derived from kóris meaning bed bug – apparently they have the same soapy smell! Coriander has been cultivated in Greece since at least the second millennium BC. Stir 4 dessertspoons of coriander into the casserole. For those averse to the herb, use parsley instead. My huge bunch gave me at least 10 spoonfuls – the unused portion has gone into the freezer and will be used next week. Drain and rinse the lentils then mix them into the casserole, followed by half the stock, a splash of sherry vinegar and two bay leaves. Sprinkle on salt and pepper to taste. Bring the casserole to a simmer, cover with a lid and place in a preheated oven for 90 minutes at 150º C. Stir in the remains of the stock after half an hour. Remove the lid for the final 30 minutes – I added 1/4 pint of water at the final stage because the casserole was getting a bit too thick. When done, mix in more harissa to taste and garnish with a little chopped coriander. Serve with crusty sourdough bread and butter. This entry was posted in Fish, Food, Recipes and tagged aladass, brown lentils, cardamom, cilantro, coriander, harissa, lentil casserole, Morocco, preserved lemon, tomatoes. Bookmark the permalink. Sounds delicious. Great history lesson, too! Thanks Michelle …and it definitely kept the cold out! Mad – let us begin with the understanding that being born in the Baltics the story went from mother’s milk > lentils ! As so many posts during the past weeks have found their aim in Morocco, I do wish your historical cultural progression of why and how could be read by everyone on social media. Again I learned a lot . . . I love your palate in using both ‘adequate’ amounts of harissa but backing this up with the softer pimenton . . . and the cardamom takes us right back to the northern shores of Africa . . . Thanks Eha and very kind of you to say so. MD, coming from Eha, who knows her Northern African cooking, this is fine praise indeed. This looks like the most flavorful lentil I have come across. I have to try it , although I prefer to use the small French green lentils. Do you think that would work? Thanks Gerlinde – it will definitely work with French green lentils – Puy would be particularly good! Good recipe and casserole pot. Thanks Rosemary – the pot was a lovely gift from Chica Andaluza. Glad you’re enjoying using it! Very much so – thanks! Thanks Cecilia – I love beans and pulses, although I distinctly remember a time (back in the 70s), where many people seemed to serve macrobiotic lentils cooked with little other than water. Needless to say, they weren’t appetising. Oh yeah! So if you grow lentils what is the grain called. He grows soy beans for organic tofu so you never know! We eat lots of platos de cuchara made with lentils (usually with our home made chorizo) but I love all the wonderful flavours you’ve used here (preserved lemon, wonderful!) so will have to give this a go next week! Thanks Tanya – I was planning a Spanish one with chorizo next! Looking at that ingredients list, it has to be packed with delightful flavours. Great job MD. Thanks Conor – some recipes cal for chicken or lamb stock, but I think this is an occasion where less is more. A great history lesson MD. I believe Moroccan is misunderstood by many, including me. Your post has been a great education and with us having our first snow today your recipe is just in time. Thank Ron – the temperature dropped a bit more here too. I think I’d better make some more! I like the recipe and yes, I would use Puy lentils in mine. I often cook lentils starting off with frying onions then adding cooking chorizo and various vegetable – usually carrots and celery. I love the addition of sweet Pimenton. Nice with a glass of red. Thanks Sue – pimentón dulce is very useful for adding more flavour without the heat of the picante. This is such a flavorful lentil dish Mad Dog and certainly a recipe I can make as I have all the ingredients except the preserved lemon. And we have one market that might carry them. Maybe it is about time I make some again for recipes just like this. Thanks Karen – they do have a peculiar taste all of their own, but some lemon juice would probably be close.